We hope this page answers any questions you may have. Can anyone purchase from Brown Paper Packaging? I have had a few orders already with you; why am I not on account as yet? What are retail hang/sell products? 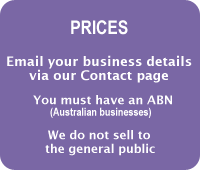 You must be a registered business (with an ABN in Australia) to purchase from us. At this stage we do not focus on the overseas market. Minimum order within Australia and Zealand is $AU100 (before GST for Australia only). Orders under $AU100 are subject to a $AU10.00 handling charge. Orders under $AU50 are subject to a $AU15.00 handling charge. Delivery is not included in the prices and will be added at time of invoicing. All prices are ex works Melbourne. All prices and discounts quoted are subject to change without notice. Using the online order form copy and paste the codes of the products you want, put the description, add the colour and quantity you want. Any extra notes or messages to us can be typed in the description section. Push send. Once you have push send you will be emailed a copy of the order for your reference as will we. For what happens next in the processing and turn around time refer information below. Turn around is approximately 7-14 working days from placement of order to receipt of goods (in most circumstances), during normal working periods. With extended turn around time during and after All Trade Fairs, Christmas Mode being November to December or any public holidays. Delivery times vary, depending on your location. Delivery times quoted are estimates only and subject to possible change in shipping schedules. Freight company's take on average 2-4 days to deliver to most destinations. Freight times tend to be extended by all carriers during peak Christmas Mode being November to December. Whilst we aim to dispatch your order as soon as possible, no delivery time is guaranteed, including overnight/express freight parcels. Due to various often unforeseen circumstances that can affect delivery including and not limited to: floods, blocked roads, traffic jams, cancelled air traffic, changes in air schedules, industrial stoppage or fire, hence no delivery time is guaranteed. Orders requested to be picked, processed &/or dispatched within 24 hours from placement of order incur an additional $15 priority charge. Credit card details MUST be provided at time of placing a priority order (orders with no payment cannot be accepted as priority). If for some reason payment is made by eft this will delay your dispatch date until after funds have cleared in our bank, - however you will still be charged the priority charge for processing and preparing your priority order within 24hours of placement, which is why credit card is preference. Please ensure to ring our office to place / confirm your priority order. - Please advise if a copy has been emailed to us as emailed orders are not necessarily seen immediately. All orders including priority orders are dispatched via regular freight (not express) unless requested by customer. Freight and especially express freight are additional charges. No delivery time is guaranteed, including overnight/express freight parcels. Due to various often unforeseen circumstances that can affect delivery including and not limited to: floods, blocked roads, traffic jams, cancelled air traffic, changes in air schedules, industrial stoppage or fire. 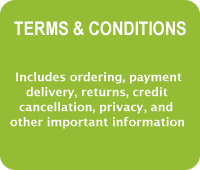 Minimum order terms still apply for priority orders. How can I obtain prices? Fill in our online Contact Us Page to request a price list. We do not sell to the public. We do not publish prices on our website. Note: Goods despatched once funds have been cleared in our bank. Claims for short deliveries and or damaged goods must be made within 48 hours of receipt of goods. It is imperative that any missing or damaged parcels be noted in writing when signing for the delivery so the freight company is also advised in writing at time of delivery. All other claims must be notified within 7 days of receipt of goods. A Return Authorization number must be issued by our returns department before returning goods. Please mark the Return Authorization number on the return parcel. Any goods accepted for return must be unused and in original condition. All goods returned whether change of mind or ordered incorrectly are subject to a 25% restocking fee (minimum $12). In the case of change of mind or wrongly ordered products then the cost of returning the goods is at the expense of the buyer as is the cost of delivering the Exchange/Replacement items, and the goods returned will be subject to a 25% restocking fee (minimum $12). Any replacement / exchange items must be paid before dispatch unless you are an account customer. Credit / Refund of returned items can only be agreed & finalised upon final sighting of the returned goods. Goods sold as stock clearance or on sale will not be accepted for return. If goods are faulty then we will get the goods back at our expense and there will be no restocking. We can send a limited range of sample papers, ribbons and bags and some of our boxes. We DO NOT post samples of all our boxes. We do, however, sell a variety of Starter Packs. Starter Packs give you the option to view one size in a particular range in all available colours. Starter Packs are perfect for displaying the full range in your shop then ordering stock as required. Starter Packs allow you to play around with packaging options, labelling and colour combinations, etc. Freight charges vary on each order depending on: what you have ordered, the number of parcels, weight / cubic measurements of your parcels, your location / postcode, your delivery address (shop, residential or PO Box) along with any special delivery instructions which may affect which freight company is used. All orders are sent via regular road freight. No order is sent via express post or overnight express unless specifically requested and arranged at time of placing the order. Freight charges are calculated at time of picking and packing your order prior to dispatch. Delivery times vary, depending on your location. Delivery times quoted are estimates only and subject to possible change in shipping schedules. Freight companies take on average 2-4 days to deliver to most destinations. Freight times tend to be extended by all carriers during peak Christmas time being November to December. Whilst we aim to dispatch your order as soon as possible no delivery time can be guaranteed, including overnight/express freight parcels. Due to various often unforeseen circumstances that can affect delivery including and not limited to: floods, blocked roads, traffic jams, cancelled air traffic, changes in air schedules, industrial stoppage or fire no delivery time is guaranteed. Should delivery be attempted to your business, be it a warehouse, shop, office or residential property which is unattended and/or nobody is available to sign for & accept delivery, and/or if the delivery driver is not able to access the property and/or not in a position to leave the parcel on your property, then they may choose to return the goods to their warehouse or our office, resulting in redelivering at a later date, - then any extra delivery charges that Brown Paper Packaging Pty Ltd incur will be on forwarded to you, the buyer and automatically charged to your credit card. Extra charges include having the parcel returned to an appropriate distribution depo and then redelivered to you at a later date. If delivered is to a home address or business that is not yet open you must advise our office at time of placing your order. All deliveries are 'Receipted Delivery', meaning you must sign for your parcel(s). Drivers can only leave your parcel(s) if instructions were listed on your order & therefore address label(s). Otherwise best to provide an alternative delivery address including the name of business it could be delivered to if different from original, so that drivers can match the delivery address to the business. Prior to signing you must confirm the correct number of parcels have arrived as listed on the freight company's delivery docket. Write comments on drivers consignment note regarding any damaged or missing parcels. Without comments listed on freight companies copy of the consignment note then we have no recourse with the freight company on your behalf. Should the goods not be signed for on receipt of delivery then neither Brown Paper Packaging Pty Ltd or the freight company will accept responsibility for damage or loss of missing parcels. Please contact our office so we can check the status of your order and/or track its position with the freight company. All deliveries are 'Receipted Delivery', meaning you must sign for your parcel(s). Australia Post will put a note in your letterbox advising you there is a parcel waiting for collection at your nearest post office. StarTrack, TNT or Ipec will only leave your parcel(s) if you have advised our office at time of ordering "its ok to leave" and is subject to the driver being able to access your property to leave the goods only if marked on the labels. Otherwise they will be redirected back to us. Redelivery charges apply. NOTE: any delivery times quoted are only estimated and subject to possible change in shipping schedules. For home or shop deliveries when nobody is there to accept and sign for the parcel(s), please refer to answer above. Please notify our office immediately of the situation so we can review your order and check the situation internally and with the freight company. It is imperative that prior to signing to accept the delivery that any discrepancies (be it missing or damaged), are marked on the consignment note. Without the freight company also being advised there is no recourse for their office to assist with rectifying the situation. It is not enough just to tell the driver. The information needs to be in writing. Please advise the freight company name, your account number and their contact number. Appointments are available Monday to Friday, 9.00am - 2.30pm only. Bookings are required. Please telephone to make an appointment. Please bring proof of business trading details with you. Please send your order at least 3 days prior to avoid extra charges * and to ensure stock is in the warehouse. That way we can prepare the goods for you and ring you when everything is ready for collection. Minimum order terms still apply for showroom collections. Appointments available Monday to Friday, 9.00am - 2.30pm to collect your order. If you have not pre-ordered or you are a new customer you must allow time for processing your order while you wait. Orders requested to be picked, processed &/or collected within 24 hours from placement of order incur an additional $15 priority charge. Minimum order terms still apply. Can I open an account with Brown Paper Packaging Pty Ltd? Yes. First you need to establish a consistent buying history with us. If you are only ordering once or twice a year it is unlikely an account will be approved or remain open. However upon your request for a credit application we can email an application to you or we can include it with an existing order already going out to you. You then need to complete ALL areas of the application and return it to us for our accounts department to process. Upon approval a letter will be posted to you confirming your account details with a copy of our account trading terms. Note if an existing business / shop owner opens another trading outlet then a separate credit application is required for each outlet even if operating under the same trading name and owned by the same owner. Any change in business ownership needs to be advised in writing and the account will automatically be closed. New owners will be placed on proforma (and remain on proforma) until a new credit application is completed and approved by Brown Paper Packaging Pty Ltd.
All goods remain the property of Brown Paper Packaging Pty Ltd until payment is received in full. Note: Brown Paper Packaging Pty Ltd may at any time without warning withhold any further orders and or cancel / suspend or close your credit account if your account payments are consistently late, or the account has been inactive for more then 18 months. You need to have completed (in full) our credit application and returned it to our accounts department for processing. Upon approval a letter will be posted to you confirming your account details. Please allow a minimum of 7 days for processing your application, (which may at times take longer during our peak modes or be held up waiting response form trade references). Upon your request we will post you a credit application or we can include it with your current paid for order. Brown Paper Packaging Pty Ltd may at any time without warning withhold any further orders and or cancel / suspend or close your credit account if your account payments are overdue, consistently late, or the account has been inactive for more then 18 months. As a result a new credit application may be required. Change of ownership must be advised in writing. Any accounts operating under the previous owner(s) name will automatically be closed. New owners will be placed on proforma. You need to establish a consistent buying history with us particularly if you have no business history or trade references. In the meantime a new credit application can be completed and if approved by our office a letter of acceptance will be posted to you. Retail Hang Sell is sold in a format ready to on-sell to consumers (the general public). These products tend to come pre-packed with headers (ready to hang on display), have pricing, and are in smaller quantities. Bulk products are ideal for in-store use and are available in larger quantities. We can print your logo on all types of Bags - as well as on Tissue Paper, Ribbons, and Boxes. For more details refer to the Printing section of our website. Can we use your photos & product names? No, not without our written permission from Brown Paper Packaging Pty Ltd.